HABIT: Daisy like perennial that blooms summer through fall. Light blue flowers. CULTURE: Plant in well-prepared, well-drained beds. Moderate water and fertilization requirements. Divide established plants in spring every 3–4 years. USES: Fall color, border. Cutting gardens. Considered to be one of the best perennial flowers in the world. PROBLEMS: Cutworms, powdery mildew. Can be over watered easily. NOTES: Plant in fall or early spring. 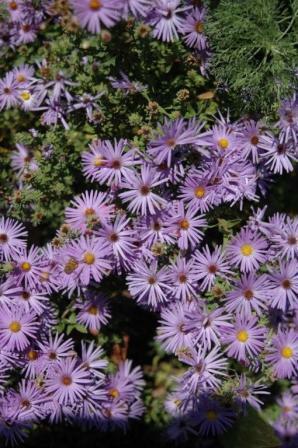 The hardy blue aster is the common fall-blooming variety. Many other varieties and colors available but A. frikartii is the most showy and blooms the longest. Others mainly bloom in the fall. Two good cultivars of A. frikartii are ‘Wonder of Staffa’ and ‘Mönch.’ Plants grown in pots can be moved indoors and saved through winter. Plant after the last freeze. Native to Brazil.